I have a little flat, so space is quie tight. You have to be a bit creative in making it look nice when you are limited in your display space. This little random shelf is in my kitchen, and is above the fridge. 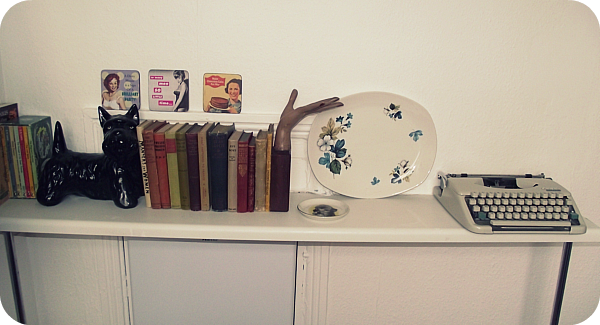 It now is a little vintage display space, which makes my little kitchen feel like mine! My bathroom is also quite compact, and I have used bright turquoise and pink to make it bright (Vegas Flamingo is my inspiration). As there isn't much space, I decided to use the actual toilet as display space. 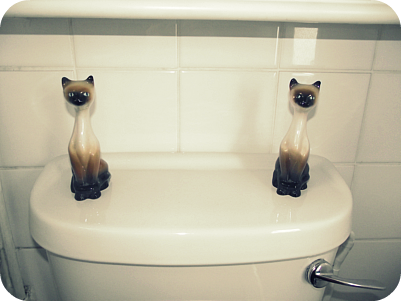 I actually love having these vintage cats there! They are super kitsch. The cats are actually my Grandad's (you can see photos of my grandad in the 1940s here). I chose them from his house after he died. I believe I was ten years old. I'm quite impressed by my taste as a young child! They used to live on his gas fire. My final little glimpse of my flat isn't retro or vintage, but has been something I've wanted to do for ages! I'm an ex-librarian, and in my library I used colour coding regularly when arranging and displaying books. 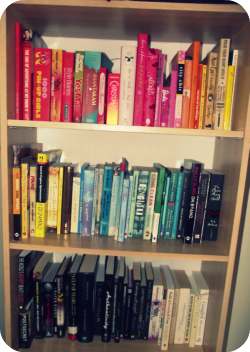 Now I finally have colour coded book shelves! Yey!